Heavy Metal at a Light Weight Price: The Baphomet Gothic 5 is now on offer for 799 € reduced from 899 €! Humbucker and Singlecoil with large polepieces deliver a powerful bass sound. The Baphomet 5 is equipped with power pickups from the German manufacturer MEC, and with its Pored Satin Black/Gold finish it presents itself as the weapon of choice for metal bassists. The high-performance MM5-humbucker in the bridge position impresses with powerful sounds which reproduce notes that can be felt in the pit of your stomach. Despite all of this overwhelming might, the attack remains crisp attack and together with the defined rendering allows for fast riffs and complex grooves even on the low B string. Its perfect counterpart takes the form of a MJ single-coil in the neck position, expanding the sound spectrum with warmth and crystal clear transparency. The active MEC 2-band electronics ensures for a flexible sound, regardless if dominating low-end drive, aggressive growl in the mids or brilliant solo sounds with higher assertiveness, even in extreme settings the equalizer is very musical and delivers suitable sounds. The special finish highlights the grain of the Ash body. 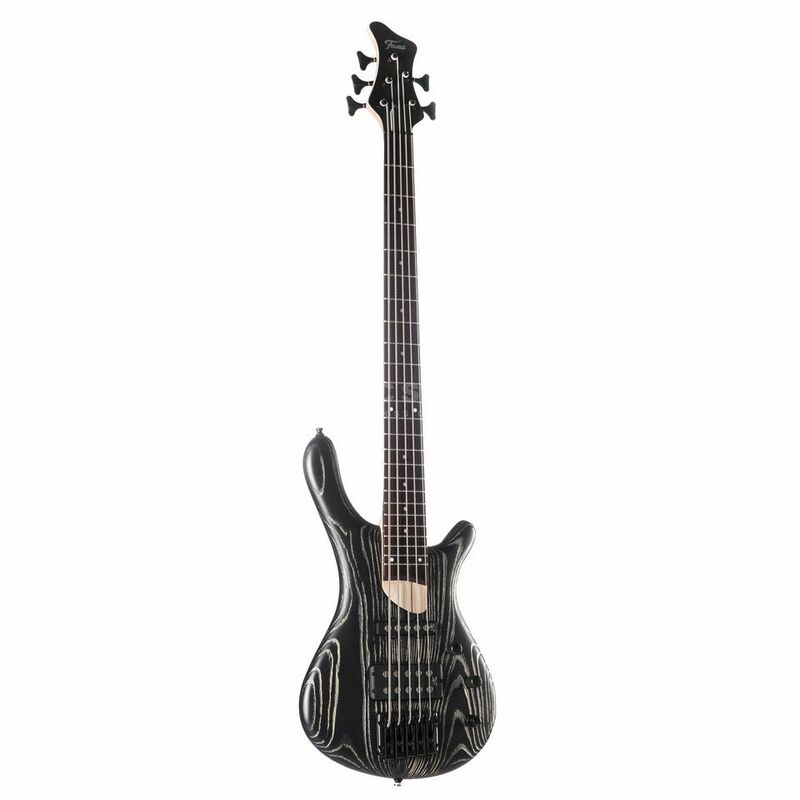 As with all of the models of the Fame Baphomet series, the Gothic 5 possesses an arched body, unique in its price class. The body is crafted from Ash and is shaped to conform to your body, offering the ideal playing position. The special lacquering process emphasizes the grain of the wood, giving this instrument a premium image. The sycamore maple/mahogany neck is easy to grip with its flat D profile and delivers rapid runs and complex riffs with its oil finish. The hardware of the Fame Baphomet Gothic 5 is supplied by the popular manufacture WSC Partsland, the solid WB65 bridge supports the exceptional address and sustain characteristics of these basses and guarantees perfect intonation, while the light-weight JB15 tuners are absolutely tuning stabile and prevent top-heaviness. The Fame Baphomet Gothic 5 MM/J is also equipped with Schaller Security Locks, to make sure that your precious instrument doesn’t crash to the floor during wild performances.